It dawned to us that we never made numbers public since doing integrations with Two Tap. Following FB’s announcements around FAN and the general focus on mcommerce as of late, Two Tap might be in a good position to set some expectations. And with the overall consensus that selling products in ads is almost impossible we’re excited to open up some of our numbers. 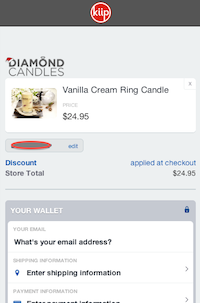 Kiip – the mobile rewards network – is testing some ecommerce products with Two Tap. They display an interstitial that pushes the user to redeem an ecommerce reward which sells a product, and Two Tap powers the experience of buying directly in the ad. Having landed in the cart 7.35% of all users end up finalising a successful purchase. 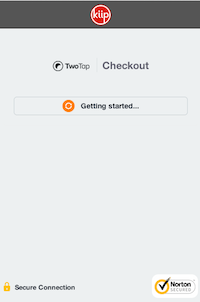 They enter shipping and billing in Two Tap’s shopping cart and never have to leave the initial app to go through the checkout process on the retailers page. Another way to evaluate the numbers is to say 1.26% of everyone who clicks the Kiip interstitial makes a purchase when the shopping cart is brought in front of them. So what are a couple of factors that increase the conversion rate in this scenario? The product sold is fairly neutral(it doesn’t have to be fitted / tried on etc) and also has a twist which makes it more appealing (a candle that has a ring inside of it. W00t!). It’s also not very expensive and it’s a better than usual deal by having a discount attached. 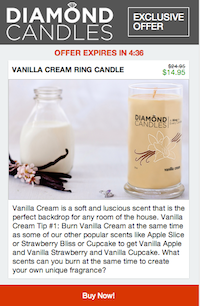 There’s also an attached timer to redeem the offer but currently sitting at 5 minutes it doesn’t place huge pressure on the shopper. It’s important to note these results are NOT based on targeted traffic. This is general mobile traffic in apps. Attaching any user targeting data to this process yields much better results. These results are based on users buying a product because they’ve seen it in a banner and the data in this particular case has been consistent over the past week. Questions? Ideas about other products that could be sold on mobile ad networks? Reach out at hello@twotap.com. Happy selling!